In these lessons, students will examine the key characters in A Midsummer Night's Dream and their dramatic functions. Tasks include: performing speeches featuring the fairy characters, analysing their otherworldly language; watching an extract of the opening scene and debating who holds the most power; and writing Agony Aunt style letters in character . Can I explore the dramatic function of the fairies in A Midsummer Night’s Dream? Can I develop my ideas about how the fairies could be portrayed on stage? To dew her orbs upon the green. Students can experiment with different ways of performing these lines (e.g. laughing, whispering, like a nursery rhyme, chanting, overlapping, repeating, accentuating certain words, adding actions, varying volume, pitch, tempo). How would the different ways of performing these lines affect the audience’s impression of the fairies and the woods? Students should read the following background information about how fairies were viewed in Shakespeare’s time. Make a list of points that are being made here about fairies. In Shakespeare’s day, it was common to believe in fairies or spirits. These creatures were magical beings that had no souls but could interact with humans. Fairies were considered ugly like goblins or elves. People believed they could fly, become invisible, and enjoyed riding, hunting and dancing. They also liked eating great feasts and sometimes even stole food. Fairies ate beef and bread, but they loved milk and cream. People thought that fairies punished men and women for behaving badly. If a house was messy, fairies would play tricks on the housewife. They hated dirt and disorder. Fairies also cursed livestock and caused disease. Sometimes they would pinch people or steal their children. Students could then look closely at the passages from the play that are printed in the Student Booklet, and find evidence of any of these points within Shakespeare’s text. Alternatively, students could read the extracts from the scene that have been included in the Student Booklet and answer the linked questions. Students should read and rehearse Act 3 Scene 1 lines 124-194, identifying examples of rhyme, rhythm, alliteration, repetition, and other techniques. As a group, they should discuss how to make the fairies seem different and otherworldly in their performance of this scene. Students should think about the many different ways they can use the choral reading techniques from the ‘Prologue’ activity, and about how these decisions might affect the audience. What do the fairies represent? What is their dramatic function? How would I portray the fairy characters if I were staging the play? 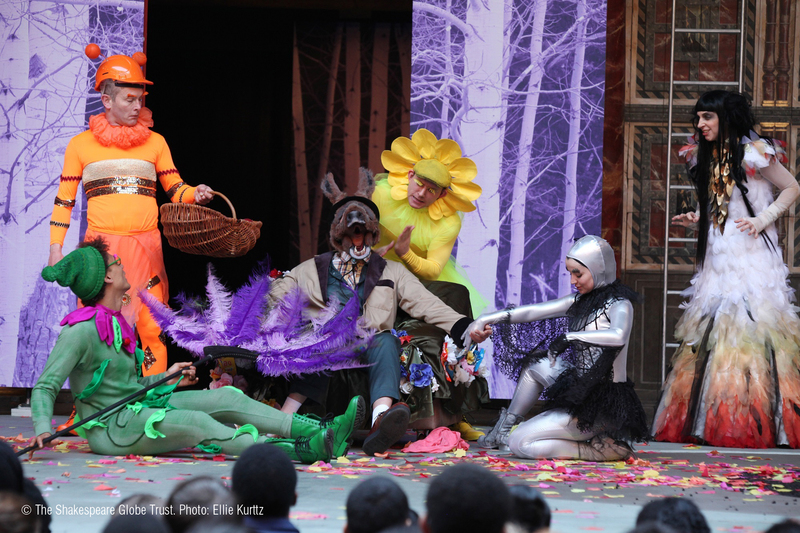 Ask students to share one great idea about portraying the fairies on stage, e.g. voice effects, costume, movement, lighting. Encourage original thinking! Elizabethans thought that fairies could change shape and size at any time. Usually they would be the size of small children. At times, they could even be as small as ants. The fairies in the play are small enough to crawl around in acorn cups. They are named after items that are small, like cobwebs and mustard seeds. Titania’s Fairies were probably originally played by small boy actors. As a quick creative starter or homework activity, students could come up with some modern fairy names inspired by small items. Students could research how the fairy characters have been portrayed in a variety of other productions on the stage or in film. An additional task might be for students to compare and give their personal views on two or three different interpretations, e.g. 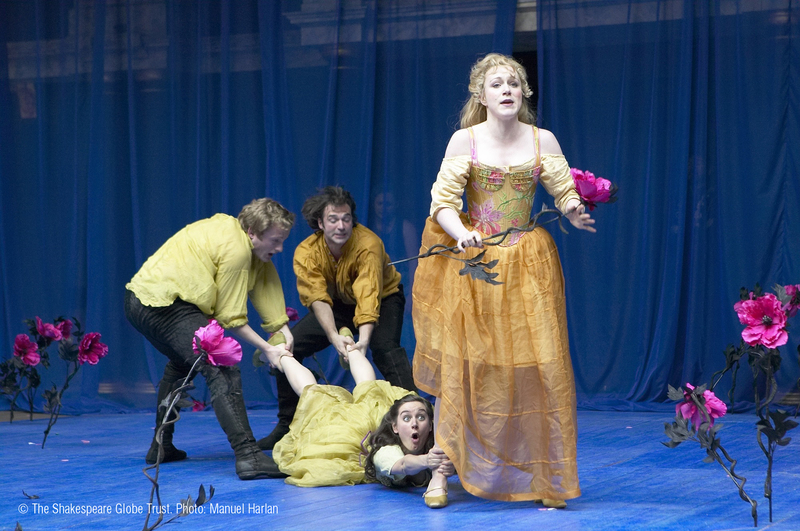 in the Globe’s Gothic-inspired 2012 adaptation, in Robert Le Page’s 1992 version set in a swamp with reptilian fairies, the circus skills of the fairies in Peter Brook’s 1970 Royal Shakespeare Company production. Can I read some key passages from the play and extract information about Demetrius, Helena, Hermia and Lysander? Can I search for quotations that give me clues about these characters’ thoughts and feelings at different points in the play? Can I analyse some of the language they use in order to explore their characters? How much do we know about these four characters (their appearance, background, family members, friendships, fortunes, etc.) Who is being described in each of these quotations, and what do we learn in each one? Students could ‘adopt’ one of the four characters and write a series of short ‘agony aunt’ letters. These could explore their respective characters’ journey through the play with its various plot twists and complications. Students could be encouraged to weave into their letters some brief quotations, e.g. as the ‘headline’ for their letter, or to record something another character said to them within the letter. Sample letters are provided in a handout. This activity could also work as a hot-seating activity; a student playing an ‘agony aunt’ on the hot seat answers the audience’s prepared queries. Students could collect textual evidence about the four characters in response to the prompts in the Student Booklet, recording their findings on the detective’s notepad provided. The prompts encourage students to use information retrieval skills, inference and deduction to find out more about the characters. In the Student Booklet, students will find comments by Louise Collins and Peter Bray, who played Hermia and Lysander at the Globe in 2012. Students should read the actor viewpoints and reflect on the prompts provided. What have today’s activities added to my understanding of these four characters? Does my view of them change as the play goes on? Do they become more or less sympathetic or more or less believable, for example? Students write on a sticky note some words, pictures, diagrams, quotations and calligrams showing the thoughts and feelings of the four characters. Working together as a class, students should build up four distinct brainstorms about Demetrius, Helena, Hermia and Lysander. Ask students to consider how each of the four characters’ thoughts and feelings change as the play moves on. The Staging It materials for this play relate to Act 2 Scene 2 lines 34-64, a dialogue involving Hermia and Lysander in the woods. The following lesson continues to focus on the four lovers and will provide students with a more thorough experience of reading and analysing Act 3 Scene 2. Can I explain the complex relationship and plot developments that occur in the play involving Hermia, Helena, Lysander and Demetrius? Can I analyse Shakespeare’s language to help me understand these characters’ thoughts and feelings in some key scenes? ‘Hang off, thou cat, thou burr! Who said what, to whom and why? Support students to bring out in their feedback insights into the characters’ relationships, situations and problems. As an extension activity, students should look for some more colourful insults from this scene! editing the scene – where could cuts be made and why? Encourage students to write about rehearsal room strategies they have used to explore this scene in the Rehearsal Diary section of the Student Booklet. Distribute large pieces of paper (representing each of the play’s five acts) and smaller pieces of paper (representing each of the play’s scenes). Students are going to create a flow diagram to show what happens to these four characters throughout the play, act by act and scene by scene. They could depict the fortunes of each of the four characters in different colours. Arrows could be used to show connections between characters, for example, ‘loves’, ‘hates’ and ‘loves because of magic’. Key quotations from each of the four characters might also be added. N.B. This activity could be done in small groups to create posters or as a whole class to create a wall display. Students should work in groups of four and each member of their group should select one of the four characters: Demetrius, Hermia, Helena or Lysander. 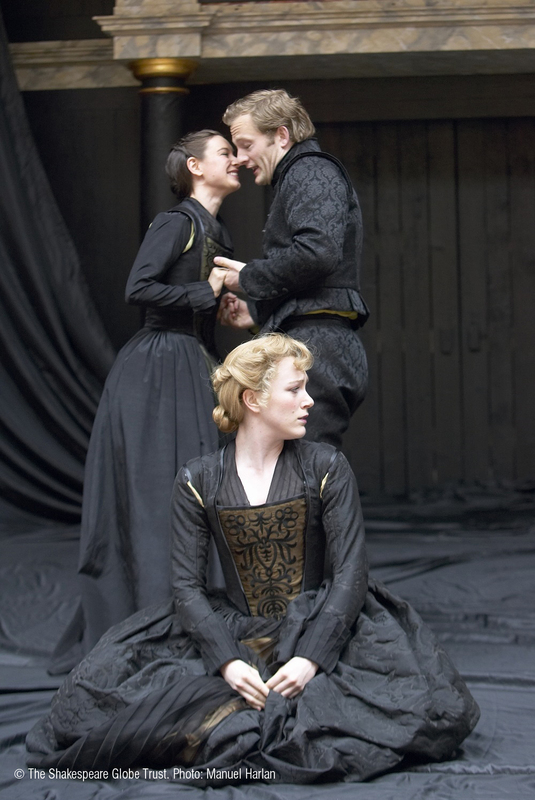 Students could then view and analyse the images of their chosen character (all taken from the 2008 Globe production directed by Dominic Dromgoole). The images are in the Character PowerPoints, which you can print off as a hand out and which have space on which to make notes. These are available in the Downloads section at the bottom of this page. Students should examine each image, firstly thinking about how they would place them in order. They should then find an apt quotation to use as a caption for each image, and develop their ideas into a more detailed and insightful comment. For example, what their character’s appearance, body language, words, etc. show us about their thoughts and feelings at this point in the play. Students should then feedback to each other within their groups. What do we learn about the four young Athenian lovers as the play progresses? How does Shakespeare create comedy from their predicament? As a class, select no more than eight images from productions of the play. Students should sequence them to make a photo-story about the complicated love quadrangle between Demetrius, Helena, Hermia and Lysander. The teacher should ask students to justify their choices. This activity could also be completed as a homework task, and students could use their own artwork or captioned photography (using a piece of software such as Comic Life) in place of production images. Which word is missing from each of these quotations? Who said it and about whom? The answers can be found in the Lesson Plan download. For more detailed activities exploring these characters’ quarrels, disagreements and the language they use, see the KS4 Language materials. Can I establish the status of the characters in A Midsummer Night’s Dream in relation to each other, and how this changes throughout the play? Can I identify different ways in which status is shown on stage? Students should watch a version of the first part of Act 1 Scene 1 (up to line 127), making notes about who has power, who doesn’t and why. Ask students to pick out quotations to support their points, and to utilise these quotations when they feedback. Fiona Banks describes a selection of status games in Creative Shakespeare. This game, involving a pack of playing cards, will support students’ understanding of rank and status in the play. It can also lead effectively to discussions about such themes as marriage, order and society, and the role and status of women in Shakespeare’s Athens. Explain that high numbers from the pack of cards denote high status, whereas a low number such as an ace denotes low status. Students will be given a playing card and should hold it to their head without looking at it. They will walk around the room for a few minutes and see how other students react to them. Finally, students should line up according to what they think their status is and then altogether check to see the number on their card. Draw out in the ensuing discussion how status can be shown on stage and say that as well as being about someone’s title, appearance, how they speak, behave, etc., it is also shown by how others react to and behave around them. In small groups, students should read the three extracts in the Student Booklet. Using the status numbers from the pack of cards activity earlier, ask students to decide which status number they would give the characters who are speaking and who are spoken about in these passages. Discuss and justify why they gave them these numbers. Students could then perform these scenes using these insights about status to inform details of their performance in the various roles. Students should write a paragraph about how the various characters’ status has changed or remained the same by the end of the play. They should comment on at least three characters and provide evidence to support their views. Encourage students in their final remarks to broaden out their analysis into a more thematic comment about power and status in the play. For example, the relationship between men and women, the relationship between the different social classes, how Shakespeare compares and contrast the earthly powers of Theseus with the power of the fairies. What different kinds of power do characters have over each other in A Midsummer Night’s Dream? How does this change? How could this be shown on stage? How does Shakespeare draw parallels between the world of the Athenian court and the fairy world to explore notions of power and status? 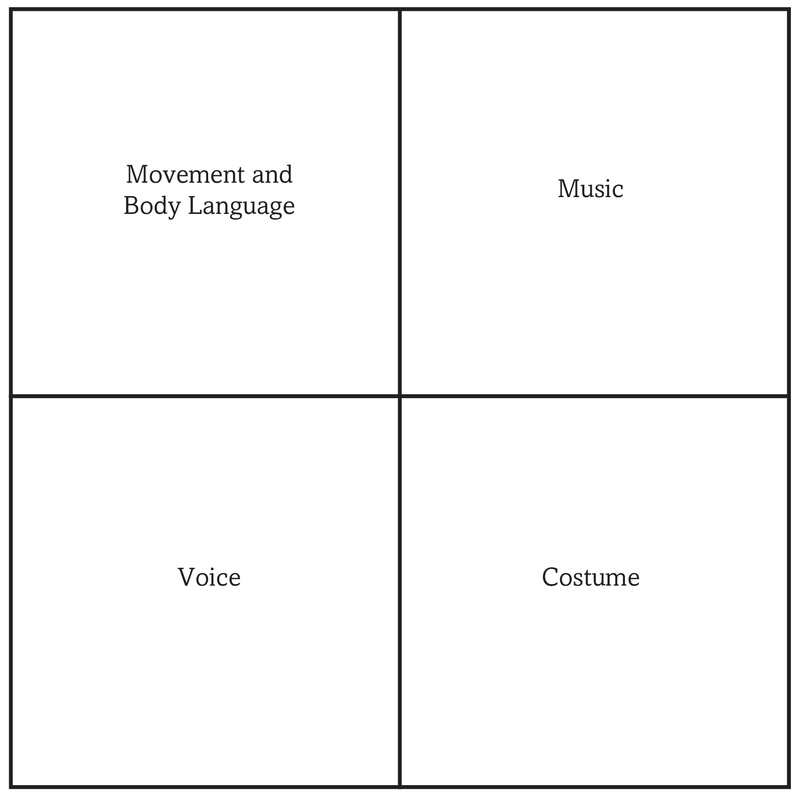 Students fill in a simple grid with four boxes: movement and body language; music; voice; costume. Students choose a character at a particular point in the play and think about how their status could be shown using these elements of stagecraft, making notes in the boxes. Choose a few students to feedback. Students could be encouraged to make connections with other Shakespeare plays that explore the relationship between fathers and daughter, e.g. Romeo and Juliet, The Merchant of Venice, The Tempest, The Taming of the Shrew, King Lear. Exercises relating to the themes of order, society and marriage can be found in Key Stage 4 Themes. They include a more in-depth activity about the character of Hippolyta. Can I work within a group to perform a scene using only a cue script? Can I assess the contribution of the Mechanicals to the play as a whole? Show students the stage direction at the beginning of Act 1 Scene 2. Enter Quince, the Carpenter; and Snug, the Joiner; and Bottom, the Weaver; and Flute, the Bellows-Mender; and Snout, the Tinker; and Starveling, the Tailor. Ask students to create a table and to collect key pieces of information about each ‘Mechanical’: their full names, their trade, and - as an extension activity - anything else they learn about them by reading ahead. Take feedback and clarify with students what each job description actually entails, e.g. tinker, bellows-mender. Discuss briefly with students how Shakespeare’s audiences might have reacted and related to these characters, and why. Explain that in Act 1 Scene 2, Peter Quince hands out parts to his actors, probably written on long strips of paper. Actors in Shakespeare’s time did not have a complete copy of the play. Each got his own part, handwritten, with just his lines, and his cue – the very end of the last line before each of his speeches. Actors relied on these cues of one to three words to know when it was their turn to speak. This meant that each actor knew little about what other characters were saying or doing until they rehearsed, and they had to listen to the other actors very closely. Before reading this scene, students could share the Mechanicals’ experience of learning a scene by being assigned their ‘parts’ using the Act 1 Scene 2: Cue Scripts resource (available in the Downloads section at the bottom of this page). Explain to students that in Act 3 Scene 1, the Mechanicals have found a spot in the wood to rehearse the play. You could display the scene as the class reads through it together. Supporting your students, highlight and draw attention to words that give us further insights into Shakespearean theatre, plays and stagecraft, e.g. rehearsal, stage, tiring house, comedy, prologue, device, eight and six, cue. The Mechanicals imagine the place in the woods they have found to be just like an Elizabethan theatre with a stage and a tiring house. The tiring house is the area behind the stage, which nowadays we call the ‘backstage’. It was where the actors would wait or ‘retire’ to hear their cues before going on stage. It was also where they would get dressed into their costumes (their attire). Props and costumes belonging to the company would have been stored in the tiring house and so would instruments and range of other backstage items, such as makeup, wigs and fake beards. Shakespeare’s company used many props (‘properties’) ranging from small handheld items to large objects. Things like coins, purses, letters swords and handkerchiefs appear in many plays. More unusual items included tombs, a hell-mouth, two steeples and a chime of bells, a ‘great horse with his legs’, and even a ‘chain of dragons’. These various props were often critical to a play’s plot, just as the wall and its chink are so important to the narrative of Pyramus and Thisbe. Shakespeare’s theatre did not use scenery. At most, cloth ‘stage hangings’ could be draped over the tiring house at the back of the stage. These did not picture the location of the stage. These did not picture the location of the scene, but they did have certain associations. For instance, they sometimes used black stage hangings when performing tragedies. Outlines of what happens in the play, called plots, were fixed to the wall inside the tiring house, so that actors knew where they had to be for each scene. The other side of the tiring house wall (the side the audience could see), called the frons scenae, was elaborately painted and decorated. In Act 3 Scene 1, Shakespeare asks his audience to use their imagination on two levels. The play is being performed on an actual stage, which the audience has to pretend is a ‘green plot’ and then re-imagine as a stage. At the same time we are asked to pretend the tiring house is a ‘hawthorn brake’ and then a tiring house again. More information about Shakespeare’s theatre can be found in the Historical and Social Context Lesson Plans. The climax to the Mechanicals’ story comes when they perform their play at Duke Theseus’ wedding. Students should watch at least one version of this scene in performance and answer the questions in the Student Booklet. What is the effect of the Mechanicals’ scenes on the audience? What is their importance in the play as a whole? What does Shakespeare seem to be saying about theatre, actors, amateur dramatics, etc.? Show students the Mechanicals PowerPoint, which includes images of the characters from various Globe productions (available in the Downloads section at the bottom of this page). Then give students a set amount of time to write a few director’s notes about at least two of these parts. How would they cast them? What advice would they give to the actors playing them? What costumes and props would each character need? etc. Take feedback. Skilled workmen like Bottom and Quince often performed in amateur plays in medieval and Tudor England. They belonged to guilds and from the medieval period onward, the guilds of many English cities held annual religious mystery play cycles. 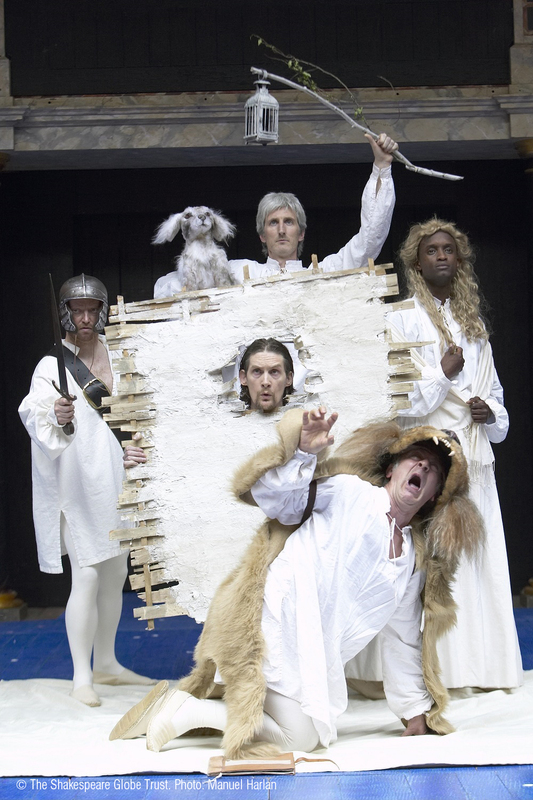 Mystery plays were Bible stories performed as short plays, and each play or story was acted by a different guild. These were dying out during Queen Elizabeth’s reign, and Shakespeare does make fun of his amateur actors. Another activity involving the Mechanicals and cue scripts can be found in the Key Stage 4 Text in Performance Lesson Plans, along with prompt questions for reflecting on the advantages and disadvantages of cue scripts. Within the Key Stage 4 section, you will find detailed activities about Bottom under Characters. You will also find an activity about the idea of casting women in some of the Mechanicals’ roles in the Key Stage 4 Text in Performance Lesson Plans.